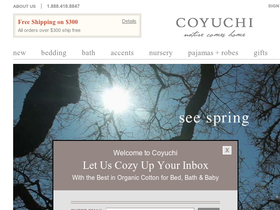 Coyuchi, online at Coyuchi.com, is the online headquarters for organic and natural bedding. Coyuchi offers organic cotton bedding, air weight towels, pleated sateen duvet covers, and seersucker duvet covers. At Coyuchi, you can also purchase jersey sheet sets, percale sheets, diamond jacquard sheets, and flannel sheets. Wool blankets, linen blankets, and muslin coverlets can be found at Coyuchi as well. In addition, linen and sateen shams as well as decorative pillows, mattress pads, bathrobes, and pillow protectors are sold at Coyuchi. Visit RetailSteal.com to find the best Coyuchi coupon codes, Coyuchi discounts, Coyuchi coupons, and Coyuchi promo codes. Shipping and handling rates at Coyuchi depend on the pricing of your purchase and your shipping destination. See website for full details. Exclusions may apply. Click link to activate a 20% discount on your bath and lounge purchase from Coyuchi.com. Use the coupon code and enjoy free shipping on your order of $100+ from Coyuchi.com. Shop the Winter Sale online at Coyuchi.com and enjoy up to 40% off top products. Shop at Coyuchi.com for organic towels, from only $7. Click link to shop. Shop for organic pajamas, starting as low as $32 from Coyuchi.com - click link to shop. Buy select crib shams at Coyuchi for as low as $34 online. Click link to shop now. At Coyuchi.com, buy air weight bath towels for $40. Click link to shop online. Buy seersucker robes at Coyuchi for only $60 when you shop online. Click link to purchase now.